Image by Oum Mun-Hee/For more photos, see here. 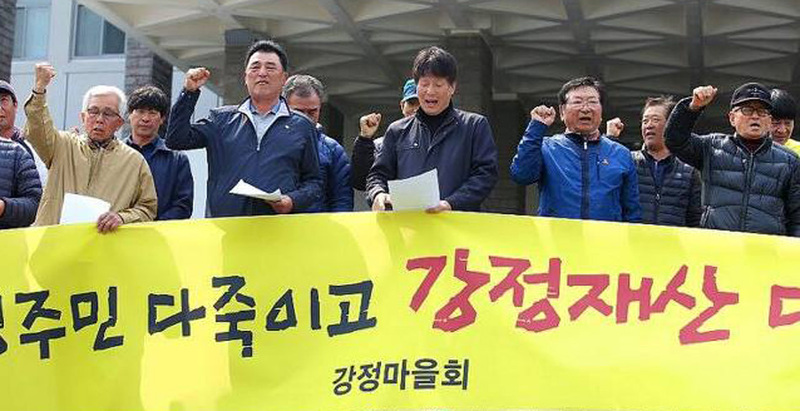 Villagers’ press conference in front of the Island government hall on March 30 to demand the navy to drop down the unjust suit on reimbursement against people. 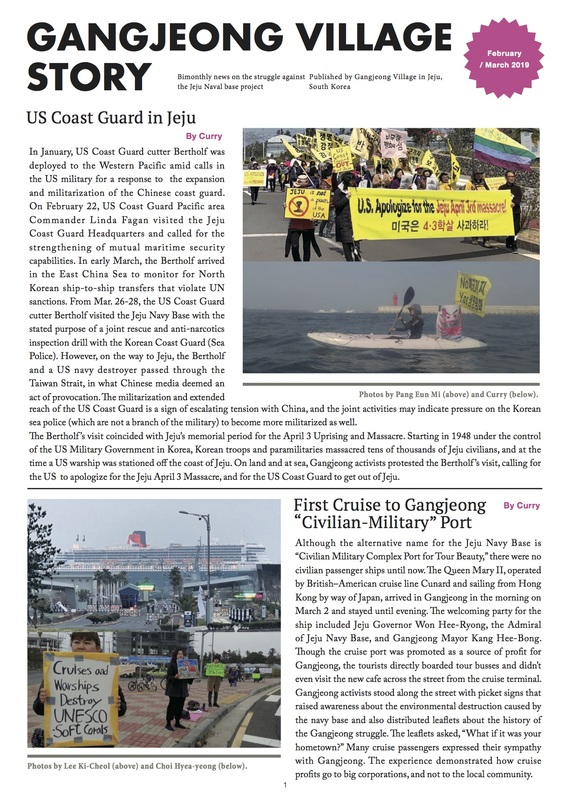 The ROK Navy is claiming a sum of 3.4 billion won [approximately 3 million US dollars] in damages against 116 individuals including residents and clergy and 5 organizations. The Navy is demanding this money in compensation for the losses incurred by the construction company due to a 14-month delay in construction in the naval base due to residents, etc. obstructing the work. We (Minbyun) found that this case is an unjustified declaration of war against the people. If the state suffered property loss, would it be fair to take individual citizens to trial to claim reparations? In pursuing its objective, the state has the power to seek criminal punishment and to take many steps including administrative measures, fines, penalties, non-compliance charges, etc. and the imposition of various administrative monetary sanctions. If such a state were to suffer financial losses due to a delay in construction and were to claim compensation from individual citizens, this could be used as a weapon to block all those who are critical of any state policy in the future. In this kind of situation, who would be able to oppose state policy? When ominous heavy equipment destroys the foundation of life with no hesitation, citizens have no other power but to use their own bodies to stand in front of it. Before carrying out so-called ‘state policy’, the state should listen carefully to its citizens’ voices. When the reckless development of the state and large construction companies threaten the right of citizens to a peaceful existence, the right of citizens to oppose this must be guaranteed as their natural and constitutional right since sovereignty rests with the people. To condemn this action as illegal is to delegitimize the foundation of democracy. The insistence that the construction delay was caused by residents is groundless. There are multiple complex reasons for the delay in the construction schedule.The principal reasons include disputes and controversy over the legality of the work, suspension orders issued over illegal construction work, losses and damage to structures caused by the natural environment, the strong wind and waves of Gangjeong’s coastline, Typhoon Bolaven, Typhoon Neoguri, etc. It is sophistry and exaggeration to claim that the residents blocking construction vehicles from entering and leaving the base for only a few minutes at a time caused the delay. The Navy read and copied an enormous amount of criminal case records in the prosecution office in order to prepare this civil case. Individual criminal case files contain very important personal information so they only can be provided to a third party based on legal grounds. For example, in cases where the parties have applied for a trial or where the need to conduct an investigation is recognized, it is possible through a decision of the court. Even before the Navy can properly file a lawsuit on legal grounds, it must reveal whether it copied individual criminal case records. Minbyun defines this claim for reimbursement not as one simple trial but as a provisional seizure used to strangle workers. Like this, it has a historical connection to the suppression of labor. It has a dishonest intention to extend dangerous statism to the judiciary. Minbyun will organize a legal team to fight for the 121 people and will make efforts and take measures to inform the public both domestically and internationally about the unconstitutionality and illegality of this case. The state should stop threatening citizens with this case. It should get out from behind this case and get down on its knees in front of its citizens and apologize for causing them pain. To see the original Korean commentary by MINBYUN, see here. The translation above was done in collaboration by the members of the Gangjeong Village International team and posted here under the permission of the MINBYUN. The above is also re-blogged from here.